The city of San Francisco plumbed the depths of its adorableness reserves today, transforming itself into Gotham City in order to grant the wish of a five-year-old aspiring Batman. The stunt was organized by the Make-a-Wish Foundation, known for granting outlandish wishes to kids with life-threatening medical conditions. Batkid Miles ended treatments for leukemia, which he's had since he was 18 months old, in June. He's currently in remission. Also, currently Batkid. In 2010, 13-year-old Eric Martin, aka “Electron Boy” got to help Spiderman rid Seattle’s streets of crime. The adventure culminated in a Space Needle showdown, during which Martin saved the city from Dr. Dark and Blackout Boy. Make-a-Wish is famous for being inventive in their wish-granting, often with results that go far beyond the kids that dream the big dreams. In 2003, nine-year-old Ben Duskinworked with a LucasArts game designer to come up with Ben’s Game, in which a skateboarding Ben battled chemo and cancer. Two years later, kids in hospitals around the world were playing the game (which had been translated into nine languages), and the Dalai Lama was honoring Ben at the “Unsung Heroes of Compassion” ceremony. Miles has quite the full day of city-saving, accompanied by a larger, older Batman who's able to actually drive the Batmobile and get the city's savior to his destinations on time. Highlights of the day have included saving a woman tied to cable-car tracks downtown, foiling a bank robbery plotted by the dastardly Joker in the Financial District, and eating a truly well-deserved lunch in Union Square. But superheroes get no rest: after lunch, the Penguin kidnapped the San Francisco Giants' mascot, spiriting him off to AT&T Park, no doubt to be saved by the heroic miles. We have intel that once he's accomplished that heroic task, he'll be awarded the Key to Gotham City at City Hall. Such a massive adventure took a lot of people to put together. Even the San Francisco Chronicle got in on the action, printing a special-edition front page announcing, "BATKID SAVES CITY" with an article by a certain Clark Kent. 1,000 of the papers were initially printed, but city residents are so enthusiastic about their tiny superhero that the special page will be printed inside the front cover of the paper's Saturday edition. Oh, and this totally happened as well. It's been an exhausting day of city-saving for Miles. 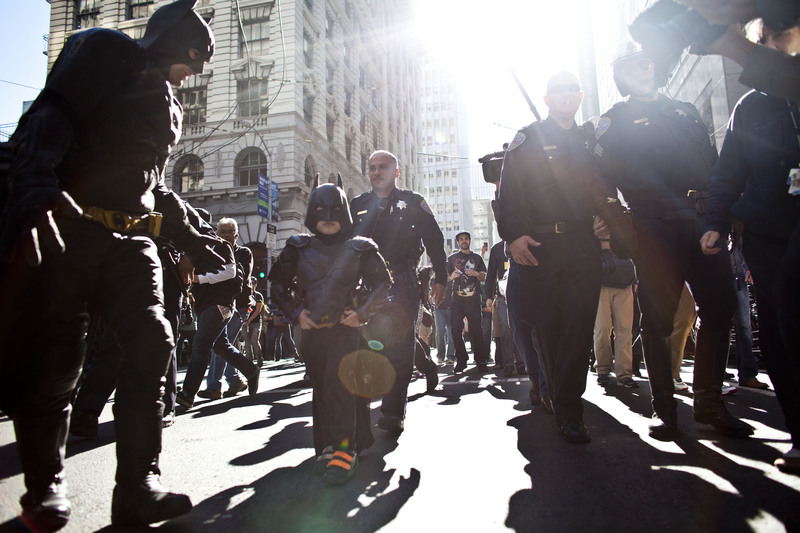 Follow the continuing adventures of the Batkid here, and keep an eye out for him on Twitter with #SFBatKid.